This year, Bluto (sometimes Brutus), Popeye the Sailor's main foil - at least in the movies - turns 80. As you are (by your own definition) Popeye's number one fan, could you introduce Bluto the character to those of us who don't already know him (though there are probably few)? Bluto is a muscular brute with a beard and his eyes are usually drawn squinted. He is recognized by wearing a short sleeved black shirt with a captain's hat or a white sailor's uniform. 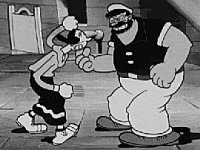 In several of the theatrical cartoons Bluto is seen serving in the Navy. He seeks romance with Popeye's girlfriend Oilve Oyl. Olive will often allow Bluto to court her until he asks for a kiss. When Bluto starts to pucker up Olive screams for Popeye's help. In print Popeye can defeat him without eating spinach, but this is rarely the case in the animated cartoons. Bluto was first introduced into the Popeye-comicstrip in 1932. What can you tell us about the character's first story? 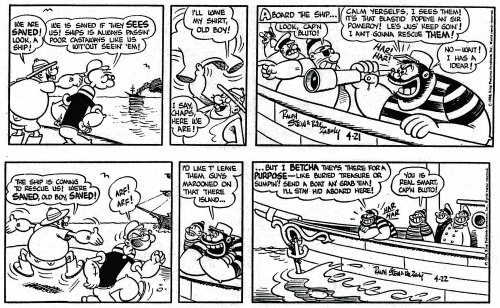 Bluto was introduced in a daily continuity called The Eighth Sea by Elzie Crisler Segar. The story is known for Popeye and Bluto fighting each other for two straight weeks! At this time the comic strip was not known as Popeye but as either Thimble Theatre or Thimble Theatre Starring Popeye. Interestingly, Bluto never caught on in the Popeye-comicstrips. Any explanation for that, and what can you tell us about some of the foes Popeye had to come up against in the comics? I would not say Bluto did not catch on. He certainly made a very memorable first impression on the newspaper reading audience. 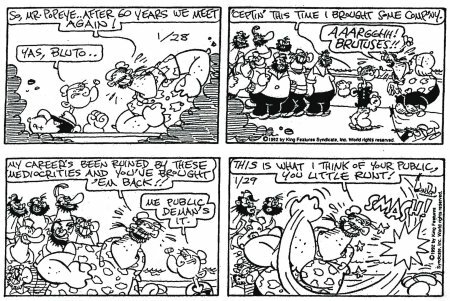 Often times Segar would use characters in his daily or Sunday strip for several weeks. When he felt all could be done within a particular storyline people would vanish. If Segar lived longer Bluto may have returned. Popeye was often battling muscle-bound brutes who felt they could easily beat the sailor to a pulp due to his size. Two memorable opponents were Alice the Goon and Toar the caveman. Both originally fought Popeye but Alice later became Swee'pea's babysitter and Toar one of Popeye's closest friends. How would you describe the original Popeye-comics by Elzie Crisler Segar to begin with, especially in comparison to their movie adaptations? Well Segar has been described as the Charles Dickens of the comic strip medium. It was no doubt difficult to translate this kind of storytelling style to animated films. 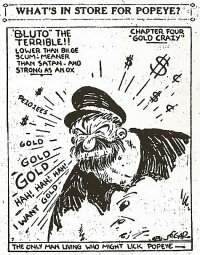 In Bluto’s case Segar originally billed the brute as as, "Lower than bilge scum, meaner than Satan and strong as an ox! The only man living who might lick POPEYE!" He definitely lived up to Segar's description being drawn as a huge man! Bluto stood 2 full heads taller than POPEYE and outweighed him at least 5 times! His desire was to break Popeye's neck and kill his friends. When the Fleischer Studios used him in the theatrical films, Bluto was still a hulking brute but with a comical nature and hearty laugh. In the cartoons he was often seen trying to show up Popeye to win Olive Oyl's affections or use Popeye as a punching bag. It has often been said, among fans and critics, even in the weakest Popeye cartoon a trace of Segar’s influence can be found in the sailor man. Both Popeye and Bluto made their big screen debut in the Max Fleischer-produced Betty Boop-short Popeye the Sailor in 1933. What can you tell us about that movie, and how do the depictions of Popeye and Brutus compare to both the comicstrip and later movies of the Fleischer-era? This cartoon basically introduced the Popeye-Olive-Bluto romance triangle with Betty dancing the hula mixed in the plot. When Bluto first appears and makes a play for Olive, she keeps bopping him in the kisser to little effect. During this cartoon the audience witnessed Popeye's amazing strength prior to and after eating his spinach. During Bluto's brief tenure under Segar in the comic strip he did not display any romantic feelings towards Olive Oyl nor did Popeye eat a can of spinach to defeat Bluto. Popeye finally unleashed his twister punch on the brute. Believe or not, Bluto and Popeye were actually friendly rivals in a few of the theatricals. A few examples of these are Lets Celebrate (Fleischer Studios, 1938), Fightin Pals (Fleischer Studios, 1940) and Olive Oyl and Water Don't Mix (Fleischer Studios, 1942). The Fleischer Studios Popeye-series was an enormous success and this is due in part to a variation in storyline and character's motivations. Once the Fleischer Studios moved from New York to Miami, Bluto was absent from many cartoons. More plots featured Popeye's father Poopdeck Pappy or had the sailor encountering William Tell, an annoying fly, Eugene the Jeep, spinach-hating nephews, and hungry crows. In your opinion, the best/most important Bluto-cartoons? One of the best and most important in my mind was The Twister Pitcher (Fleischer Studios, 1937), where Popeye and Bluto compete on the baseball field. In the opening scene Popeye's spinach can falls in front of Bluto. The brute mutters, "Oh boy he dropped his spinach, what a break for me!" This established the fact Bluto was aware of the attributes of eating spinach and took advantage of it. When I first saw this as a kid it made me yell at the television screen (in the Fleischer cartoons) for Popeye to hurry up and eat his spinach whenever Bluto was involved. I had no doubt, if given the opportunity, Fleischer's Bluto would knock it out of the sailor's hand or consume the vegetable himself. What -- No Spinach? (Fleischer Studios, 1936) featured Bluto as the owner of a restaurant. This film dealt more with his relationship with J. Wellington Wimpy. Of course Bluto’s first appearance in a color cartoon from the two-reeler Popeye the Sailor Meets Sindbad the Sailor (Fleischer Studios, 1936) is historically important. Bluto, as Sindbad, entertained the audience by singing at the beginning of the film. I like the ending to The Anvil Chorus Girl (Famous Studios, 1944). Popeye and Bluto compete to be Olive Oyl's assistant in her blacksmith business and the lady chooses the bearded brute! Bluto is overjoyed until he learns Olive has left him in charge while she goes off with Popeye. She Sick Sailors (Famous Studios, 1944) is a delightful cartoon where Bluto shaves off his beard and impersonates Superman! He uses tricks to best Popeye at every turn and becomes murderous when shooting a machine gun at the sailor! Fortunately the bullets just shatter Popeye's spinach can. Nearlyweds (Famous Studios, 1957) has Bluto almost marrying Olive Oyl. This cartoon is unique because Popeye uses his wits rather than spinach to stop the wedding. How Green is My Spinach (Famous Studios, 1950) was fun because Bluto finally wised up and attempted to destroy the nation’s spinach crop to beat Popeye once and for all. Fortunately a little boy watching this cartoon in a movie theatre tossed his can of spinach to the one-eyed sailor. Bluto’s Bike Bullies (Hanna-Barbera, 1979) was interesting because Bluto began the cartoon as a motorcycle bully. By the cartoon’s end he had reformed and become a patrolman. I recall an episode from Popeye and Son had Bluto returning a gift he had bought for his wife knowing Popeye’s son wanted to buy it for his mother. Considering Bluto’s mean streak in these cartoons I thought this was out of character. Is there any indication what Popeye-creator Elzie Crisler Segar himself thought about the popularity of Bluto in the cartoons, and why he never brought him back in his comicstrips? Honestly not too much has been written regarding Segar’s reaction to the animated films with or without Bluto. Segar did mention it was a strange experience to see his creations talking and moving on screen. More than likely he would have recognized the popularity the character was having on the motion picture audience and would have found a storyline to bring him back. In 1942, the Popeye-cartoons were taken out of the Fleischers' hands (to put it mildly), which according to many also caused a slump in quality. To what extent did that affect the character of Bluto? I am one of the Popeye fans who did not notice a big slump in storylines until the series entered the 1950's when stories began to focus on the Popeye-Olive-Bluto romance triangle. This is where Bluto became known strictly as Popeye's rival for the affection of Olive Oyl and seeing spinach prompted the conclusion of the film. Bluto’s role in the cartoons was pretty well-defined at this point without much variety. After Paramount cancelled the Popeye-series in 1957, producer Al Brodax started to produce a series of TV cartoons in 1960, but oddly enough, Bluto was renamed Brutus. What is the explanation for this, and what can you tell us about the series as such, and Bluto's/Brutus' depiction by Brodax and company? Well for years the rumor had to do with Walt Disney being upset because Pluto sounded a lot like Bluto! I wrote to actor Jackson Beck, who provided the voice for Bluto in the Famous Studios theatrical films and Brutus in the cartoons produced for television by King Features Syndicate, asking about the change in his name. He wrote back stating Bluto was a late character in Popeye and possibly owed by Fleischer and Paramount Pictures. When King Features decided to produce the television cartoons they had to change the name. In fact Bluto was owned by King Features Syndicate, as he first appeared in the comic strip. King Features believed Paramount and Al Brodax changed his name to Brutus after Cesar’s assassin. 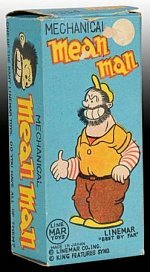 Until the name Brutus was settled upon, Popeye encountered a lot of Bluto-looking characters in the newspaper strip and comic books named “Mean Man”, “The Big Guy That Hates Popeye” and “Sonny Boy”. Sonny Boy was the most frequent moniker and he was the son of the wicked Sea Hag! In the television cartoons Brutus was not just a rival for Olive Oyl’s affections. He was a criminal, dogcatcher, circus strongman, hotel manager, steamboat captain, gas station owner, beatnik, skinned diver, gladiator, magician among his assorted occupations. The name Brutus was first used on television and merchandise in 1960. Because comic strips and funny books have to be produced in advance, Brutus did not reach the Popeye comic book pages until Popeye #64 (1962). Oddly this issue also featured another Bluto-looking unnamed brute in a different story. The name finally stuck with Popeye #67 (1963). In the Sunday page it is believed Brutus debuted on September 30, 1962. A daily strip featuring The Sea Hag’s attempt to shoot Popeye into space began with Sonny Boy as the witch’s helper. However on January 29, 1963 Olive Oyl angrily uses the name Brutus to the individual previously referred to by Wimpy as “her boy”. The “her’ being The wicked Sea Hag!?! Bud Sagendorf, who was Segar’s assistant, had to deal with what to call these unnamed bearded musclemen. Yet another reincarnation of Bluto (now called that again) graced the small screen from 1978 to 1982 in Hanna-Barbera's The All New Popeye Hour (extended to Popeye and Son in 1987). What can you tell us about Bluto in that series? Bluto was now voiced by character actor Allan Melvin (best known as Sam the Butcher from The Brady Bunch) with production handled by Hanna-Barbera. Because The All New Popeye Hour was aired on the CBS network the old violence could no longer be shown. Bluto relied much more on his wits and dirty tricks to thwart Popeye. The All New Popeye Hour (later renamed The Popeye and Olive Comedy Show) was a big success on Saturday mornings and lasted for five years (1978-83). Popeye and Son was an unsuccessful attempt by Hanna-Barbera & King Features Entertainment to update the characters. Popeye was married to Olive and had a spinach-hating son named Junior. Bluto was also married to a frump named Lizzie. The series (thankfully) lasted only one season on CBS (1987-88). Since this is about Popeye and Bluto, we of course also have to cover Robert Altman's live action Popeye starring Robin Williams, with Paul L.Smith as Bluto. Now how good an idea was it to turn the comicstrip into a live-action movie to begin with, and your opinions on Paul L.Smith's portrayal of the brute? First let me put to rest what has been often said about the film being a flop! It did turn a profit and Paramount Pictures wanted a sequel. The acting, including Paul L. Smith as Bluto, was excellent. However many of the original songs were horrible and the script was a rehashing of Segar’s stories. The problem with the movie was the story being based on Segar’s original comic strips from the 1930’s. The movie going public, at this time, mainly knew Popeye from the cartoons. Had the film been based upon the more widely known animated version of the characters, its critical reception might have been improved. According to my information, the last (official) on-screen-appearance of Popeye and Bluto was in 2004's computer-drawn Popeye: The Quest for Paddy. A few words about this one, and in your opinion, how well do the characters work in a computer-generated enviroment? I did not enjoy this because the plotline had to do with Popeye searching for his long lost Pappy. This storyline had been done in the comic strip by Segar and three more times in animation. An original plot would have been appreciated. Many fans (and rightly so) were not happy with the relationship between Popeye and Bluto being more buddy buddy. While they did fight, their actions were lost in a cloud of smoke. If, for politically correct reasons, you cannot show the pair brawling, keep Bluto out of the story. I am not an expert on CGI, but I could see there was an honest attempt to recapture the look and sound of the Fleischer films. After Elzie Crisler Segar died in 1938, several attempts were made to reintroduce Bluto/Brutus back onto the Popeye-comicstrips. Want to talk about those attempts for a bit? I would like to take this opportunity to clear up a fact which I and other historians have mistakenly stated. It has long been believed Ralph Stein’s first scripted daily Thimble Theatre adventure was published in 1955. I actually stumbled upon his first strip which was printed on December 6, 1954. Stein wrote adventures where Popeye traveled around the globe with a British explorer Sir Pomeroy. By 1957 Stein had brought back Bluto, and Popeye was often running into him and his gang of pirates. Bluto was more of a comical brute - but mean-spirited and treasure happy. Towards the end of Stein’s tenure on the daily strip, Popeye battled Burlo, the beardless twin brother of Bluto. Bill Zaboly applied the artwork to Stein’s fantastic tales. When Bud Sagendorf took over the comic strip, a number of nameless bearded brutes appeared. I believe it was in 1965 when Brutus became a regular cast member in the daily strip though he had been appearing in the Sunday prior to this. Brutus had none of the maniacal strength of Segar’s Bluto and could be knocked out by a punch from baby Swee’pea. 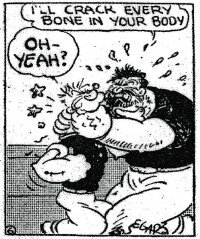 When Bobby London took over the daily strip he revived Segar’s version of Bluto. London produced a hilarious story called The Return of Bluto where all of the various versions of Bluto/Brutus meet to decide who is the real Brutus! Bluto, with the Sea Hag’s help, gets all the Brutuses tossed in jail along with Popeye. Naturally Bluto’s victory is a short-lived one. Hy Eisman is the current Popeye cartoonist who produces the Sunday Page. I mentioned to him the character of Bluto had not yet made an appearance in the Sunday page. 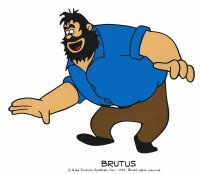 He rectified that situation and made Bluto the twin brother of Brutus. 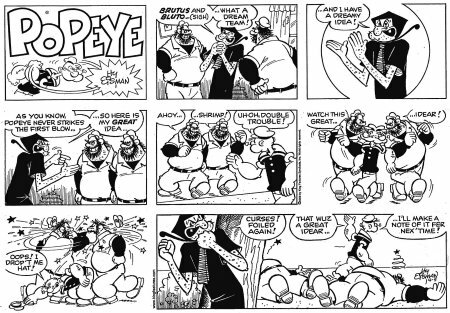 The Sunday dated April 5, 2009 featured Popeye encountering both Bluto and Brutus! The Sea Hag was thrown in so all three of Popeye’s greatest enemies appeared. What got you interested in Popeye to begin with? My mother recalled when I was three and getting my tonsils out, her sister Kay bought me an Olive Oyl doll because she loved the color red. I do remember drawing Popeye around three years of age. I recognized very early on the different look the characters had in each cartoon and began to study the animator’s credits which appeared at the beginning of each film. A Providence Rhode Island station ran a Popeye and The 3 Stooges show just before I went to school. This program would air a theatrical Popeye followed by a King Features television cartoon. Seeing a Fleischer film followed by a King Features cartoon was quite the style shock. I have to admit, even when it came to buying Popeye products, I was always partial to the white suited sailor man. Since 1983 I have had numerous articles published on the Popeye family and five books. In 1992 I began my award-winning cable access series Drawing With Fred which features… who else but Popeye! If a Popeye vs Bluto feature film would be made today, how do you think it should be achieved (as in live action vs hand-drawn animation vs computer animation), who should direct it, who should star as (or voice) Bluto, ...? Actually, Sony announced a new Popeye feature is in the works. I really have mixed feelings about any new Popeye film project. We live in such a politically correct world where the Fleischer-style beatings the characters originally took may not possibly be allowed on screen any more. If the Popeye family needs to be changed in order to adapt to these censorship restraints, I personally would rather not see anything new. If Popeye is allowed to flourish as he was originally created for print and animation, I would love to see old fashioned cell animation. I would hope, regarding the voices, it would be actors who actually sound like the characters and not hire someone because of their celebrity status. Very few performers have been able to duplicate the vocal success Jack Mercer gave to Popeye and Mae Questel, Margie Hines and Marilyn Schreffler for Olive Oyl. Since we are discussing Bluto I have to mention the outstanding voice work for the bully performed by William Pennell, Gus Wickie, Pinto Colvig and Jackson Beck. Jack Mercer also gave voice to Bluto and provided the vocals of Brutus in one of the television cartoons, Sea No Evil (1960). Any books and/or websites for further reading on Popeye and Bluto? I would check out the web page of The Official Popeye Fan Club located at www.popeyethesailor.com/club/ and many of my publications are available on amazon. Episodes of my award winning cable access series, featuring Popeye, can be viewed on the Videos on Demand section of The Watertown Community Access channel located at http://www.wcatv.org/. Thank you for the opporunity to celebrate Bluto's 80th Birthday!